When I first took up running in March 2012, 2 months before my first race (BUPA London 10k), I was prompted to do so by a group of friends who had signed up for the Amsterdam marathon and half in October. They had, incidentally, also signed up for the Dublin marathon at the same time, so for two of them at least this would be a double marathon month. And I thought they were bonkers. Ok, let’s scratch that, they were bonkers, but I had my own fish to fry, how to run. Roll on 7 months and, inspired by a successful month of both the Royal Parks half and then the Amsterdam half, and by one of the marathoners completing both Amsterdam and Dublin with a PB, I signed up for the Berlin marathon 2013 with the aim of going from zero to mara in 18 months. This was to be the last year Berlin was paid entry only and the following year became one of the many premier races worldwide that would become ballot only. Which is a shame because, when it got to September 2013 a series of injuries had cut short my march into glory and I did not run and it pains me to say I have truly regretted that decision. Surely I could have hobbled around for 5 1/2 hours. Surely. But all that is in the past. What doesn’t kill you makes you stronger, and all the past has done is make you into the person that you are today. I am here because of not running the Berlin marathon 2013. Maybe I would have given up running after it. I think it would have been my 20th race or something like that, when this year it will be my 80th for I have got a place. A shot of closure is something that I always look for. I missed the Luxembourg Night marathon and half event in 2013 due to an Eddie Izzard gig, but then ran it the following year. I missed out on the Standard Chartered City run the same year as was on holiday but ran it a year later too. After running 20 races for Pancreatic Cancer UK in 2014 they offered me a place in Berlin 2015 and I couldn’t be happier to be running it for them. Unlike the spotty training and injury filled summer of 2013 though, this year I am doing it right. I had already researched and printed off the ASICS 16 week marathon guide when one of my Twitter people Beth @cookierunner_ a Marathon runner (x11 – 3:19:59, x7 states) and lover of cookies but importantly a RRCA certified coach asked for guinea pigs for her marathon coaching regimen. I offered myself up as an ideal candidate to be coached by Beth, but remotely, as I am in London and she is in Merika. After pootling around as I normally do, running a few races here and there she sent me the first four weeks of my training plan. Now, this I like, I prefer getting the plan is bite sized chunks as it is less daunting. The 10K race at the end of the 4 weeks is the British 10K and I am actually excited to be training and hopefully, fingers and toes crossed, going to see progress in the shorter distances as I aim for the big one. What this plan doesn’t show you though, is that the day before it started I ran the Rock and Roll Liverpool half marathon. I ran it well and was comfortable, but I normally then would take the week off until Parkrun and then start running in the week after that but no. Beth had me running last night, something I didn’t want to do from work to home which would have been a 10K, so instead went home with the idea of going down to the Primrose Hill running track to do some laps. Oh it did not go well. I decided to try out a new pair of shoes. MISTAKE! Then I walked slowly to the track which is popular at the moment with groups with personal trainers. 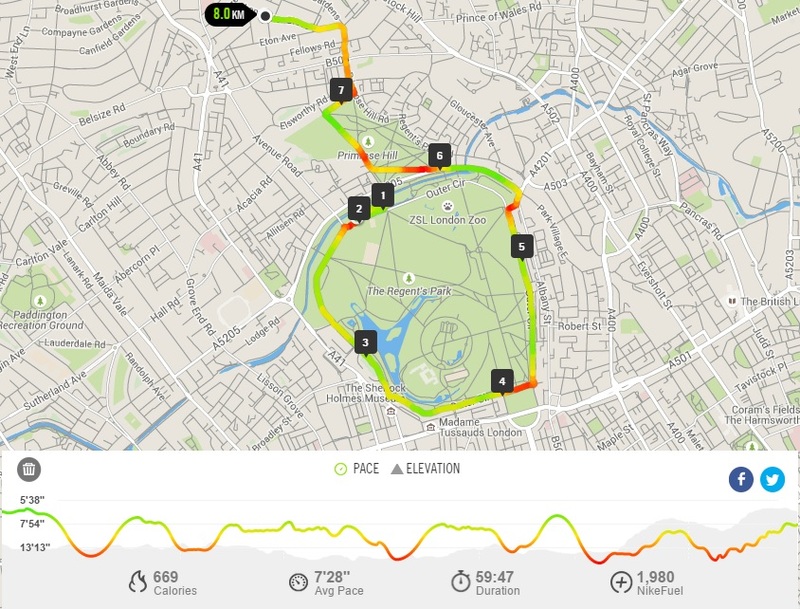 I managed 4 laps, so about 2K before running the outer circle of Regents Park, almost 4K on the dot, before heading home. It was the most painful 8K of my life. It took me an hour, which is dreadful, as I walked a lot of it, and I felt bad for not completing the distance. I could have added 2K more, but it would have been more walk than run and the way I left it means I am all the more determined to pick it up on Thursday for the next run. And so the marathon training for Berlin 2015 has begun. If you care to sponsor me, and help me reach my target please go to my Justgiving page here. If you are thinking of embarking on a marathon yourself next year or in the future, then keep track of my progress here, because trust me, if I can do this anyone can.